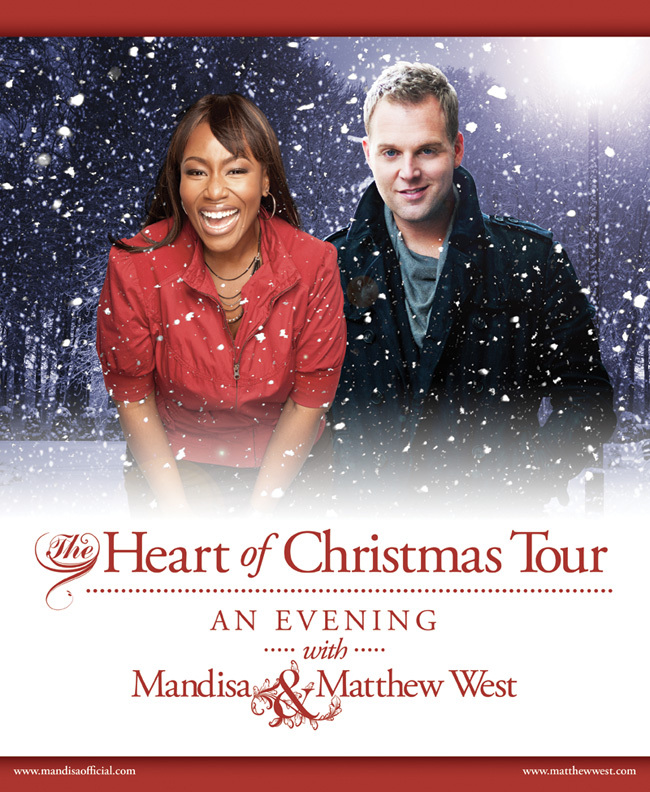 Hitting the road this December … The Heart of Christmas Tour: An Evening with Mandisa & Matthew West. Come celebrate the season with us! Dates below and we will post links to purchase tickets as we get them. Do you have plans to come to Raleigh, NC? Love to see you in concert again! Dear Mandisa two question, First, when will you come to Ontario? Now for my other question. My granddaughter who is 8 years old is a hug fan of your. Is there any chance that I could get an autograph picture of yourself? If so how much would it cost? I would save it for her special Christmas gift! If you can’t I understand, you are a very busy person. Hopping to hear from you and God bless Rhonda Brown. First – to Jenny – praise the Lord – congratulations on giving your addictions to God and loosing weight! I praise the Good Lord for you Mandisa – LOVE your music. It uplifts me and makes me smile. You are truly blessed and in turn you bless so many of us! Keep the music coming – and please come to Kansas City!!! What about Asheville, NC? Easy trip from Nashville! we need you in the northwest, specifically the Seattle area! When will you be close to your hometown area, Sacramento, CA again? My 3 y/o (she’ll be 4 y/o in one month) has got to be your BIGGEST little Fan! I would LOVE to take her to one of your concerts! You just don’t know what a blessing it is and how it touches my heart to look in the rearview mirror and see her in her car seat singing your songs at the top of her voice. Before she knew your name she called you “The pretty lady”. She now knows you are Mandisa, but she still calls it Pretty Lady Music. Her favorite song (yes she has a favorite) is Broken Hallelujah and she belts it out! She makes me cry!! I love to watch her pump her fist to “Stronger”. Just before the chorus starts she says “Here we go Grammy!” and then she starts pumping her fist in the air as she sings it. She absolutely LOVES you. My daughters and I went to Women of Faith in Sacramento in October and when I told her you were there and showed her a video of you singing a song she was just mesmerized!Then she looked up and said, I want to go see Mandisa!! When I get bigger I’m going to go to Women of Faith and see Mandisa and I will take you Grammy”. GOD BLESS YOU for having an open heart for God and for responding to His calling for you. You can see Christ’s love in your face, it shines through your spirit, and you can feel Christ’s love in your voice. Just ask my 3 y/o granddaughter Emily. She says that “God lives in the pretty lady’s heart, just like mine!” THANK YOU MANDISA for the gift you give my Emily with your music! Please come to Pittsburgh PA!!! I agree! Pittsburgh would love to have you…I’ll volunteer to help promote the event. Please come to Carmel IN. We love you and pray for you. Please come visit San Diego at the Rock Church ~ would love to see you on the West Coast! Love you Mandisa – you truly have blessed my life! You need to come to Columbus, GA or at least Atlanta! Wow, Mandisa you are so great! I love your songs and they are so encouraging to me! We would LOVE to have you in Raleigh, NC!!!!!! Remember that the Dallas / Ft Worth peeps love you too! Any chance you can work us in? Albany NY would also love to see you!!! Come to Memphis, Tennessee please! Love Ya’ll! so…do you NOT come to Oregon? This is a great state and a wonderful place for a concert! Love ya anyway! You guys should come to WA state!! I have seen so many christian artists here at the christian churches and at the creation festival except you guys! WA state would love to see you guys!! When will you be coming to Sacramento? It’s been a lon time. 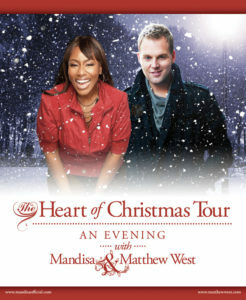 Please come to Houston Mandisa!!!!!! Show some East Coast love and come to Boston, MA pleeeeaaaase! I agree with the NC ladies! I am a college student at Gardner-Webb University (a private christian college near charlotte) and with a college students’ funds… its hard to go anywhere lol.. But Asheville, Charlotte or Raliegh, North Carolina would be so amazing (: I would love to see two of my favorite artists in concert! will see you guys in baltimore, cannot wait! we are bringing family and they always want to know will the lyrics to the songs be on a screen so they can follow along? lolol silly but would love to have the answer before they ask! We would love to have in North Carolina, either in Raleigh, Durham, Greensboro, or Winston-Salem. Mandisa please add a North Carolina to one of your tours. I love your song “Stronger”. It ministers to my heart and every time I hear it I just want to hear it over and over again! I pray that your tour truly bless those who attend and I pray that someone will come to know God as their personal savior. Be blessed! No Florida or Nashville or NYC…..I would love, love, love to hear the two of you together live…of course, I would love to hear YOU! I love you albums and your FB messages, one of my favorites! Merry Christmas! I agree with Tammy….NYC would love to have you….there is no place like New York City at Christmas time…its actually in the book 1000 places/things to see before you die. But I digress, yes come to NYC and show the glory of God at Christmas! Thank you for coming to Sioux Falls on December 1st with Matthew West, you guys were awesome and we greatly enjoyed it! God Bless you both………..Merry Christmas. jsut wondering joseph were the lyrics up on a screen for audience??? AMAZING concert at Mission Hills in Colorado Saturday night! God used Madisa and Matthew West to speak directly into the heart of my friend and myself with exactly what we needed to hear. Thank you for the “boost” to lift us up just in time to worship the new born King this Christmas! We would love to have you here in Austin, Texas. Please when are you coming? Merry Christmas to you and Matthew! i love your latest album!!! it has changed my life for the better. i would love to meet you in person. You have inspired me. Please come to fresno! Absolutely loved what you and Matthew read at the end of the concert about the impact Jesus has had on the world in 2000 years. How can I get a copy to share with the ladies in my small group?